This is for a Dancing Pinwheel Outdoor Garden Art Windmill from Shopatusm. 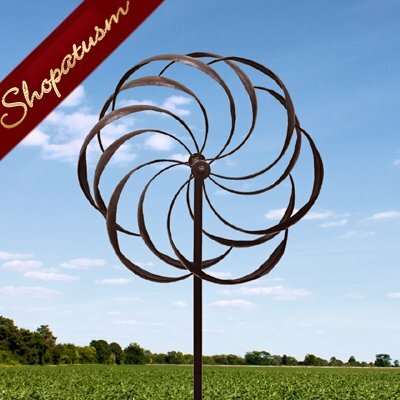 The summer breeze will dance in your yard or garden when captured by this gorgeous iron windmill. The spinning petals stand seven feet tall and create a wind-powered spectacle of style. Item weight: 10 lbs. 24 inch x 10 inch x 84 inch high. Iron. Some Assembly Required.